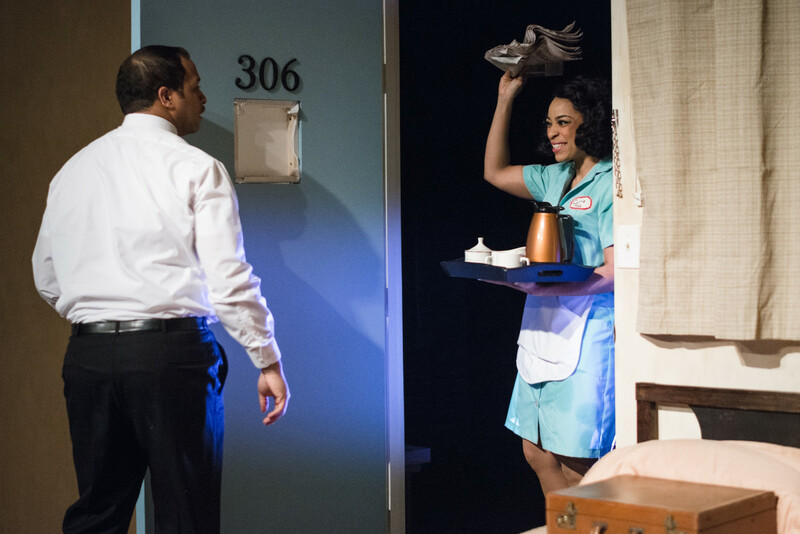 “The Mountaintop” Asks Us to Take a Deeper Look at Martin Luther King, Jr. The Mountaintop, presented by Cadence Theatre Company in partnership with Virginia Rep, opens a window to reveal a side of Dr. Martin Luther King Jr. you likely haven’t seen before. 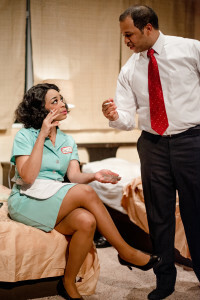 The hour-and-twenty-minute production speculates what King was experiencing the night before his assassination as he tries to unwind in his room at the Lorraine Motel in Memphis. King has just delivered his powerful “I’ve Been to the Mountaintop” speech and is now arriving at the motel. He is trying to shake off the stress of the day. In desperate need of a Pall Mall cigarette and a cup of coffee, he calls for room service. He kicks off his shoes, shuffles across the carpet in threadbare socks and waits for room service. In minutes, Camae from the motel arrives with a tray and they strike up a lively conversation. The two characters are worlds apart. Camae is spirited, swears like a sailor, and is wide open when it comes to her opinions. King, who is more reserved, especially when he switches into Dr. King mode, is fascinated with Camae and her beauty. The sexually charged banter is only heightened by Camae’s playfulness. They talk about everything from whether King should shave off his moustache to his passionate pleas for peace. Whether it’s an impending illness or the weight of his position, King is feeling sick. He feels vulnerable and unsure and expresses that to Camae. During the conversation, the tone shifts to faith and God. Their spiritual exchange is as charged as their earlier conversation. During the lively banter that follows King begins to see Camae’s true compassion and foresight. Memphis-born Katori Hall, winner of the best new play award at the Laurence Olivier Awards in March 2010 for The Mountaintop, has produced an impeccable script. Director Laine Satterfield, and assistant director Corey Roberts have given their actors room to explore their emotions and to create characters that have great dimension. And it shows on stage. Katrinah Carol Lewis who plays Camae and Jerold Solomon who takes on the role of Dr. Martin Luther King Jr. are outstanding. Their portrayals are seamless and riveting. They solidly capture the heart, the fears, the playfulness, and the spirit of each character. Even though the play is speculative, their performances give us insight into King the man, instead of the iconic Civil Rights leader many of us think we know. They remove the pedestal to reveal that he, like Camae, is human and not only filled with hopes and dreams but also with flaws. Rich Mason’s realistic scenic design and Jesse Senechal’s sound design give the show an added layer of depth. The Mountaintop is a must see. The show runs through March 12 at Virginia Rep’s Theatre Gym. The show is recommended for teens age 16 and up due to strong language and adult situations. For showtimes and tickets, visit Virginia Rep.
Next articleBroadway in Richmond is Something to See!